Uttarakhand University of Horticulture & Foresty (UUHF) Admissions to the Undergraduate and Masters Degree Programmes except for Sponsored or Fellowship holders of various postgraduate degree programmes shall be made in the first Semester of the ensuing academic year only. Read all the details of UUHF Entrance Exam 2018 such as application form, eligibility criteria, Selection procedure etc from this page. Latest: Notice Regarding Registration of UG and PG Students has been released, check the same from below. All admissions shall be made strictly on merit based on the marks obtained by the candidates in the UET except for in-service candidates sponsored by State Govt, UGC/ ICAR/ CSIR/ DBT fellowship holders and foreign nationals. Those seeking admission to various courses through All India Entrance Examination conducted by ICAR should refer to the details given below. Schedule of UUHF Entrance Exam 2018 is given below. Uttarakhand University of Horticulture & Forestry has released the admit card for the Entrance test scheduled after the successful completion of the application form. Admit Cards for the Entrance Test despatched by post at the mailing address given in the OMR application by the candidates. Candidates who fail to receive the ADMIT CARD may contact the Coordinator Admissions, VCSG Uttarakhand University of Horticulture and Forestry, College of Forestry, Ranichauri – 249199, Tehri Garhwal, Uttarakhand. In case a candidate has not received the Admit Card or has lost it, a duplicate Admit Card can be obtained from the Superintendent of the Entrance Test at the Centre of his/her examination after depositing a sum of Rs. 20.00 and a copy of passport size photograph similar to that pasted on the verification form. (c) The Admit Cards can also be downloaded from the University Website www.uuhf.ac.in OR through the direct link provided below. Online application form for UUHF Entrance Test is now available at the official website. Candidates can apply online by visiting the official website. Candidate first have to register themselves to apply online. After they will will fill the application form by login. Before filling the application form candidates must ensure his / her eligibility. Application form must be filled on or before its last date. The Application Form and Prospectus for admission to a degree programme can be obtained by post from the Coordinator Admissions, VCSG Uttarakhand University of Horticulture & Forestry, College of Forestry, Ranichauri (Tehri Garhwal) – 249 199 by sending a Demand Draft of Rs. 500/- drawn in favour of Coordinator Admissions, UUHF payable at Punjab National Bank, New Tehri (Branch Code – 3302) alongwith a request letter giving choice for sending the Prospectus through either Registered Post or Speed Post. The Application Form and Prospectus for admission to a degree programme can also be obtained on cash payment at the Designated Sale Counters by depositing Rs. 400/-. The details of sale counters shall be displayed through University Website: www.uuhf.ac.in. The candidates appearing in the qualifying examination can also apply. However, they will be required to produce original marksheet of final year indicating class/division obtained at the time of counselling failing which their candidature will not be considered for counselling. The Entrance Test fee for Undergraduate and Masters’ Degree Programmes is Rs. 1000/- for the candidates of genereal and OBC categories. The Entrance Test fee for the candidates of SC and ST categories of Uttarakhand domicile is Rs. 500/-. 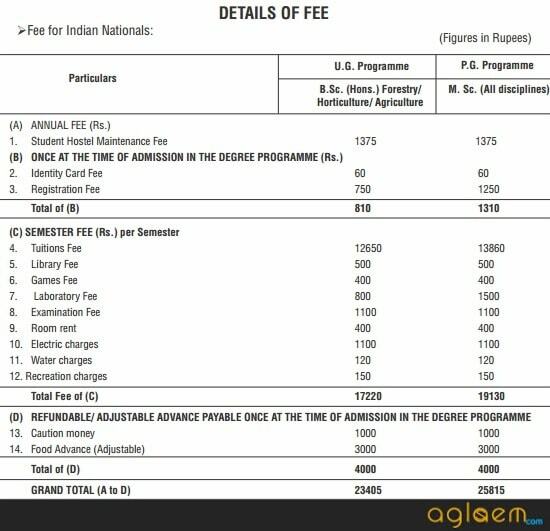 The Entrance Test fee for Undergraduate and Masters’ Degree Programmes including late fee of Rs. 200/- is Rs. 1200/- for the candidates of genereal and OBC categories and Rs. 700/- for the candidates of SC and ST categories of Uttarakhand domicile. The candidate should have clearly passed the qualifying examination i.e. (B.Sc./B.Tech. or equivalent). The candidate (except Uttarakhand Government in-service candidates and ICAR Nominees) must qualify the University Entrance Test and secure a place in the merit list to be eligible for admission. Foreign Nationals/ Wards of NRIs shall not be required to appear in the University Entrance Test, and will be given admission on the basis of Interview only. Note: B.Sc. Agriculture (Hons.) course shall be conducted by the College of Hill Agriculture, Chirbatiya, Jakholi, Rudraprayag, Uttarakhand. However, till the infrastructure is ready at College of Hill Agriculture, Chirbatiya, Jakholi, Rudraprayag, Uttarakhand, the classes for B.Sc. 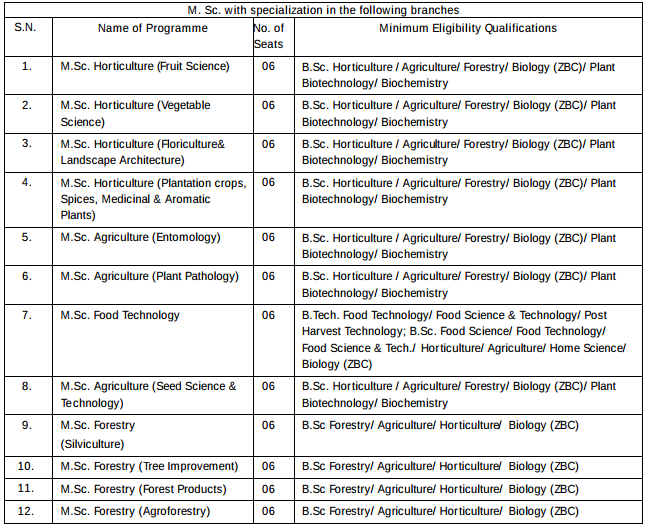 Agriculture (Hons.) will be conducted at College of Forestry, Ranichauri Campus, Tehri Garhwa. Must have clearly passed qualifying examination i.e. Intermediate or equivalent. For Indian Nationals, there shall be no minimum or maximum age limit. The candidate must qualify the University Entrance Test and secure a place in the merit list to be eligible for admission. All candidates (except specified categories) seeking admission to Masters’ programmes shall be required to take Aptitude Test and Subject Matter Test without any break from 11.00 a.m. to 2.00 p.m. on the prescribed date of University Entrance Test. The examination shall start with Aptitude Test and after 45 minutes, the question booklet of Aptitude Test shall be taken back and question booklet for group wise Subject Matter Test paper will be distributed as per the option given by the candidate based on the major subject in his/her qualifying examination. PCM paper (Code 2): The candidate who has passed/ appeared in 10+2 examination with Physics, Chemistry and Mathematics stream shall have question paper consisting of questions of Physics (60 questions), Chemistry (60 questions) and Mathematics (80 questions). The candidate opting for this group can seek admission for degree course (Hons.) in Forestry/ Horticulture/Agriculture. PCA paper (Code 3): The candidate who has passed/ appeared in 10+2 examination with Agriculture stream shall have question paper consisting of questions of Physics (60 questions), Chemistry (60 questions) and Agriculture (80 questions). The candidate opting for this group can seek admission for degree course (Hons.) in Forestry / Horticulture/Agriculture. The candidate having Physics, Chemistry, Mathematics and Biology (PCM&B) subjects at his/ her 10+2 level will have to indicate his/ her choice of the group of paper for Entrance Test in the Application Form. Such candidate(s) can either opt for PCB paper (Code 1) or PCM paper (Code 2). 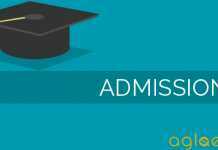 They can seek admission for degree course (Hons.) in Forestry/Horticulture. The Admissions Committee will decide the cutoff marks for qualifying the Entrance Test after declaration of Rank-wise list of the candidates appeared in the Entrance Test conducted by the University. For Masters’ programmes in the event of two or more candidates securing equal marks in the UET, the candidate higher in age would be considered. For Undergraduate programmes in the event of two or more candidates securing equal marks, the merit shall be decided on the basis of marks secured in Physics, Chemistry. In the event of tie again, a candidate higher in age would be considered. For the sake of the candidates fee structure for admissions to the Undergraduate and Masters Degree Programmes except for Sponsored or Fellowship holders of various postgraduate degree programmes is given below. For more details of UUHF Entrance Exam 2018 – Download Information Brochure.